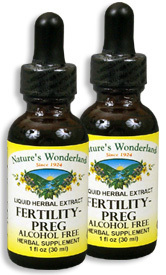 Fertility-Preg, 1 fl oz / 30 ml each (Nature's Wonderland) - Penn Herb Co. Ltd. Nature's Wonderland's Fertility-Preg blends the reproductive tonic Red Raspberry, plus the nutrient-rich Yellow Dock & Nettle herbs. It provides gentle support for maintaining a strong, healthy pregnancy. ALCOHOL FREE. AMOUNT PER SERVING (333mg/ml or 30 drops): Proprietary Blend Certified Organic Red Raspberry Leaf, Certified Organic Red Clover Blossoms, Certified Organic Nettles Leaf, Yellow Dock Root (ethically wild harvested). OTHER INGREDIENTS: Vegetable Glycerin, Deionized Water, Honey. Free of: milk, dairy, egg, fish, shellfish, tree nuts, peanuts, wheat, gluten or soy. Nourishes and strengthens the female reproductive system; supports healthy conception and pregnancy. 20-40 drops in juice or water, 2-3 times daily, or as needed. Shake well before using.